At the end of round 9, laying flat = 6.75 inches in diameter. Don’t forget to check your gauge. The ch 2 at the beginning of each round counts as 1 hdc. Don’t F/O, continue to make the first earflap. Count to the right 23 sts. Attach the yarn on 24th st, ch1, sc in next 12 sts, ch1, turn. Continue with rows 2-10 just like from the 1st earflap. 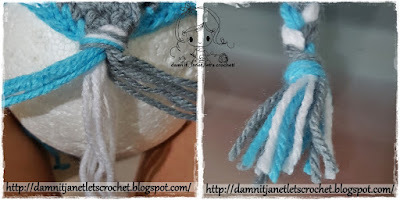 Attach yarn in any stitch and ch1, sc in each st around; working evenly around each earflap. Remember to mark your round with a stitch marker. Do another round of sc around the entire beanie. Join with a sl st in the first sc to give it a nice even finish. Cut 18 pieces of yarn (9 for each earflap) about 36 inches long. Fold each bunch in half and push the folded end through an opening in the bottom of each earflap. Pull the unfolded ends through the loop and pull tight. Braid the strands and tie a knot to secure the braid. Complete the second braid the same way. I use 3 strands of each in light blue, yellow and black; you can use just one color or any combination you like. Sew the eyes between round 7 and 13. Sew only through the white part, leave the gray areas un-sew. In the center of the brown part of the eyes sew the buttons. The mouth will be slip stitch in between round 18 and 19. Working your way up to round 16. For the hair: cut 3 pieces of yarn about 5 inches long. Fold the bunch in half and push through the top of the beanie. Pull the unfolded ends through the loop and pull tight. Cut the top ends a bit to even out the strands. This pattern is an original pattern by Janet Carrillo "damn it Janet, let's crochet!" (January 2013). Please do not claim this pattern as your own. If you wish to share this pattern, you may link to this pattern but please do not reprint/repost it on your site. You may print and keep a copy for your own personal use. Please do not resell or distribute it. 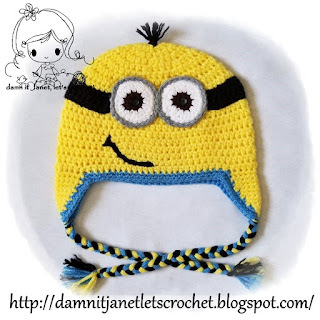 This is the perfect pattern for a minion hat. My 14 year old GD thanks you as well. Muchas gracias por compartirlo!!! Te ha quedado precioso! Saludos, desde Uruguay. This is such a neat project! Our family is planning a trip to Universal Studios in a month and this hat would make a great photo shot at the theme park. Thanks for sharing; I especially love the three-tone braided ties! Thank you soooo much I love this pattern. I will enjoy making this I have 9 children so each one will be different. Ha! This is so cute. I just started crocheting 1 week ago and my daughter sent me this. She wants 2 of them for the grand kids. I'll be starting them after Christmas! Thanks for the great pattern. This is adorable! 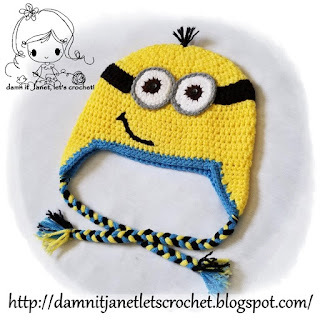 We have listed more minion hats at http://minionhat.com. I love your crocheting patterns, you could even sell them! Contact us, we would love to collab with you, too. Thank you so much for the pattern, My 2 year old grandson is crazy over the minions and I am going to make this for him for christmas...its so very cute!!!!! !